Why Hire The Party Pups? I am a licensed school social worker and wrote my thesis in graduate school on the value of animal assistance therapy for children with special needs. The Party Pups are licensed Therapy Dogs who specialize in Children with Special Needs and work in schools regularly as Therapy Dogs. The Party Pups are highly trained and are Champion Show Performance Pups who compete at a National level throughout the country. My dogs live in my house, and were raised since birth for their jobs working with children. My dogs are my family. I started puppy shows in 2001, my pups that I began this with are the great grandparents of the current performing pups. When you hire myself and my pups, you are getting professionals at your party and they will dazzle your guests and your children with their act. I work all parties with an assistant who assists in having the children interact with the pups which helps make the party smooth and professional. The Party Pups have an impressive act, they jump through hoops held by the children, they can read numbers 1-6, ride skateboards and catch balls thrown by the children in mid air! You can view our video of a party on the videos page and see us in action! Children interact with the pups on a mental level and are introduced to what dogs are capable of learning. An educational and fun experience! Your child deserves the best pups at their puppy party! We serve North New Jersey, South New Jersey, Central New Jersey, Brooklyn, Manhattan, Queens, Long Island, Staten Island and Westchester County and the entire New York and New Jersey area! In addition to the show, you are welcome to add on extra time with the pups for cuddles, petting and pictures to your heart's delight! We have the BEST puppies for children's and adult parties!!!! The adults all LOVE us too and you know that your child is safe with a licensed therapy dog! Puppy Chyna is pictured below during petting time! Cuddle time is pictured below with Puppy Pearl, Enzo, Chyna and Amber! Don't miss the chance to have the BEST for your Puppy Party in the New York, New Jersey & Connecticut area! Cuddle time is a favorite for sure! Cuddle time can be added on in any show, be sure to ask about extra cuddles! Your child deserves the best pups at their puppy party! 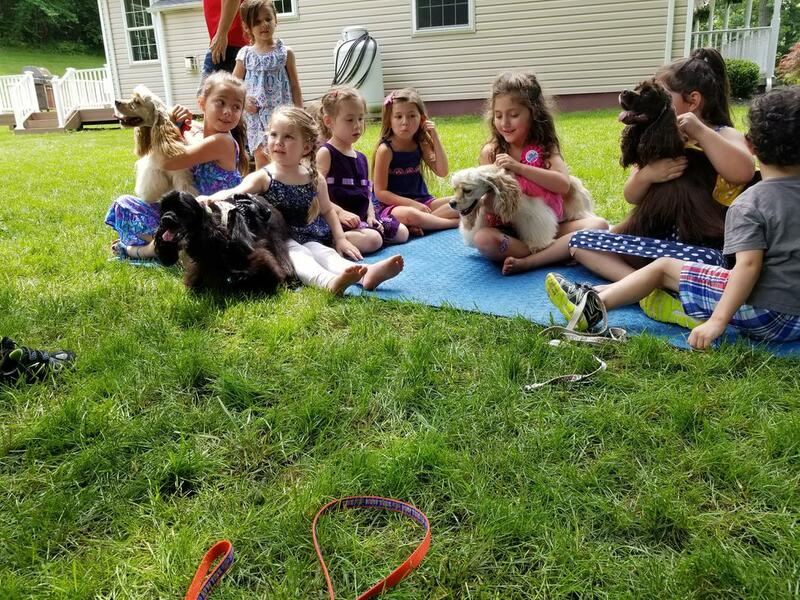 Have us for your puppy party, we go to North New Jersey, South New Jersey, Central New Jersey, Brooklyn, Manhattan, Queens, Long Island, Staten Island and Westchester County and the entire New York, New Jersey and Connecticut area! Just call and we'll come! All Pictures are the Property of THE PARTY PUPS, Dog Entertainers and Therapy Dogs For Children With Special Needs and Puppy Party for Children in New York & New Jersey & Connecticut . Have us for your Puppy Party! Best Puppy Parties NYC! What The Party Pups Do! The Party Pups come dressed in costume and the uniqueness of the show is that the pups are interactive with the children! ground, a 15 foot chute they pop out of, a 15 foot tunnel they run through, a 4 foot height apex they climb up and down, jumps hurdles and much more! After viewing the act, children will be called upon one at a time and direct the pups to perform the obstacles and give them a treat for a job well done! The Party Pups have "toss the bone" and other additional interactive acts that can be performed in smaller indoor areas as well. At all parties,The Party Pups for your event will pose for pictures with your children. The Party Pups are great for Dog Theme Parties, Birthday Parties, Holiday Parties, Block Parties and will make your child's party the talk of the town!